The waters of the hot springs are ideal for skin conditions, asthma, and rheumatism and liver disorders (Chololithiasis). Guests Kaiafas enjoy their hydrotherapy in a beautiful landscape with pine and eucalyptus and value vacations peace and relaxation away from city stress. Kaiafas Spas attract many visitors throughout the year. Hydrotherapy in these baths are among the most effective and plays an important role in the lives of residents and visitors of Kaiafas, who come from all over the world to enjoy relaxation and rejuvenation. 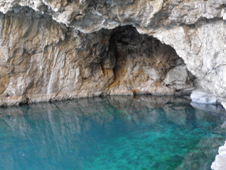 The warm waters of the baths stem from the cave Anygridon Nymphs where, according to Mythology was born Dardanus, ancestor of the Trojans. The waters have been known for their healing properties since ancient times. The curative property of the Ancients Greeks attributed to the Nymphs, who lived in forests for this and were adorned with Temples and sacred monuments in their honor. 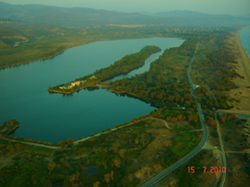 Lake Kaiafas except spas, visitors can do water sports and water skiing. 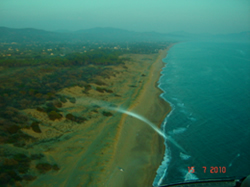 Here there are facilities for the practice of Greek team water-skiing. 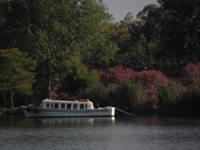 On the small island in the lake is the picturesque church of Agia Catherine. The hydro-therapeutic center Kaiafas is particularly popular with visitors of all ages from around the world. Here the visitor can combine the “business with pleasure” and leave the thermal properties not only of the baths and the serene landscape that soothes and gladdens the soul and body. It is true that visitors Kaiafas, will visit the thermal springs at some point during the holidays and stay nearby. There are many who after trying the thermal treatment back again and again and advertise the positive effects of thermal waters. If you have any questions about the spa, do not hesitate to contact us. We will be glad to help and serve you. Chronic rheumatism, skin diseases, asthma, gallstones, atypical gynecological inflammations, neuralgia, liver disorders, eczema, diseases of the stomach, intestine, gall bladder, etc. expedites quick treatment to injuries and sprains.